This compilation of spooky tales of freaky freeways, rocky roads, and terror on the turnpikes, this collection is filled with murderers, joyriders, hitchhikers, and kidnapping from Inner Sanctum, X Minus One, Big Town, Dragnet, Suspense, and more. "Backseat Driver (starring Fibber McGee and Molly"
The road is long and lonely, disappearing over the horizon. There are no lights, and horror creeps up from behind. Our anthology "Highway of Horrors" features episodes with car-related fright tales from Inner Sanctum, X Minus One, Big Town, Dragnet, Suspense, and more. The Inner Sanctum "friends of the squeaky door" hear the story of "Til Death Do Us Part." In this episode, two newlyweds witness a murder and are chased by the gunman. In "Hitchiking Corpse," a man driving west meets a mysterious, beautiful hitchhiker. In "Beneficiary Death," a businessman finds that a hitchhiker's body, killed in a car accident, is identified as his. In "You Could Die Laughing," a blackmailer confronts a man after a hit-and-run. X Minus One episode "The Parade", written by George Lefferts, this episode presents a Martian who would like the services of an ad agency for a "suspense campaign." A parade becomes the centerpiece of the campaign, June 1 becomes Martian Day, and away we go. In "The Roads Must Roll", a radio adaptation of a Heinlein story, portrays a future world in which people are transported on conveyor belts. In Big Town "Death on the highways", an unknown driver causes a truck to crash into a school bus. 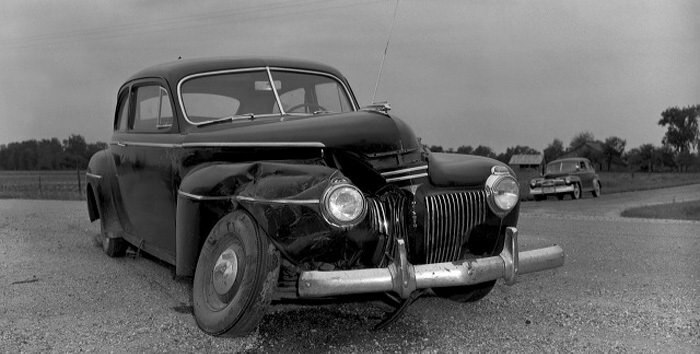 In police old time radio show Calling all Cars, three high school students bring their murder spree on the road. In "Corpse by the Road" a dead body is found after a botched robbery for a diamond ring. In "Hit and Run Driver" the victim has a red truck and a lot of unanswered questions. In Dragnet, Joe Friday and company are busy with hit and run killers and crazed drag racers. In Dark Fantasy "Pennsylvania Turnpike", an elderly hitchhiker will only ride in a car when their is a redhead on board, but why? Suspense has a number of Highway of Horrors old time radio shows and with Auto-Lite as their sponsor piping in on good highway safety and headlight usage. "Ride Down the Cajon" features a truck driver en route...with no breaks. In "Speed Trap", a drunk blonde is on a joyride with two cops on her tail. In "The Lonely Road" and man plans murder and his victim is his wife! Fibber McGee and Molly star in Suspense "Backseat Driver" where a mysterious man is waiting for them in the backseat of their car. "Report on the Jolly Deathriders" is a dramatization based on a true story. We hope that you enjoy these spooky tales of freaky freeways, rocky roads, terror on the turnpikes, and horror on the highways filled with murderers, joyriders, and kidnapping. Thank you very much. I drive quite a bit for my job and I'm never without a few detectives to make trips more enjoyable! I also really enjoy the bonus variety pack MP3s. I appreciate your service. I wanted you to know that I really appreciate the recordings. Thank you for your fine products that have kept me entertained over thousands of truck driving miles!